MIAMI (AP) — The Miami Heat sent a letter to Miami-Dade County commissioners Tuesday, saying they want to set the record straight on what the team perceives as misconceptions about the relationship between it and the county as a new naming-rights deal looms. The letter from Heat Business Operations President Eric Woolworth comes about three weeks after county officials exercised their right to take full control of negotiations for the next naming-rights deal for the arena where the team plays. The county chose an option to pay the Heat $2 million annually starting in 2020 and keep the rest. The Heat hoped for a collaborative effort on the next naming-rights deal, saying both sides would benefit. County officials did not make that offer. The current naming-rights deal with American Airlines Arena, which has been worth about $2.1 million annually, ends in 2019. The relationship between the Heat and the county is complex; the team paid the construction costs for the arena, but the facility is owned by the county, and some lawmakers have bristled over the years about how they believe the arrangement is too team-friendly. The Heat say that notion is unfounded. It’s unclear what advantage — if any — the next holder of the naming rights could glean from the Heat brand if the team is not part of the deal-making process. The team controls the arena operations. And that brand is bustling. The Heat sold 35,000 of their popular “Vice” edition jerseys last season, more of what the league calls City Edition jerseys than all other 29 NBA teams did combined and are on pace to sell significantly more this season. 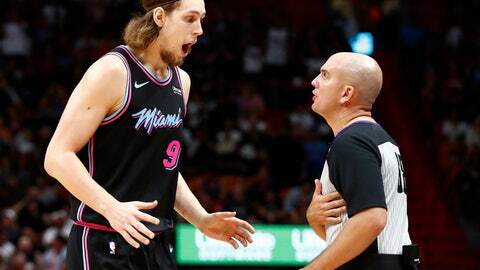 Those jerseys say Miami across the front, not Heat, and the team contends that selling them in 49 different countries makes the jerseys a walking billboard of sorts for a city that thrives on tourism. County Mayor Carlos Gimenez told commissioners that it’s believed Miami-Dade could generate up to $50 million in additional revenue over the lifetime of the deal by taking over control of the naming rights. Woolworth wrote that Heat managing general partner Micky Arison and his family have never taken a cent out of the arena or the team — “they are the kind of owners every community and every fan base wants,” Woolworth said — and pointed out that the team has spent nearly $94 million to maintain the arena, well over the $18 million that the county mandated be spent to this point in the lease agreement. There’s also a risk to the county because regardless of what it sells the naming rights for, or if the deal is delayed, it must pay the Heat $2 million per year regardless. And all this comes with the county’s widely criticized deal that gave the Miami Marlins an extremely team-friendly stadium deal still fresh in the minds of many lawmakers. The Heat believe any comparison to the Marlins’ situation is a false equivalency. “We have tried to make the County proud to be partners with us,” Woolworth wrote.